Great for weddings and parties or business promotions and marketing events or trade shows. We can take any photo, from an old print to a digital photo, and make a life sized cutout for you in a few days. Starting at just $76, cutouts are a fun way to celebrate life or grab people's attention. Our standard cutouts are mounted on foamcore to make an affordable light weight piece. Need your cutout to last longer? More durable options are available. All cutouts include a fold out stand and base for easy transportation and setup. Shipping nationwide is available. 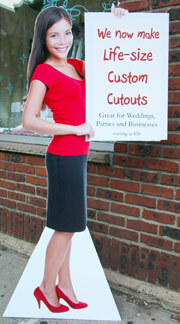 Cutouts are in 3 standard widths (24", 36", 42") and heights from 2' to 8' tall. Add a talk bubble (or thought bubble) and bring some whimsical pizzazz to the cutout.